Custom-made artificial bones for implantation in humans are being printed using 3D inkjet printers. Researchers at the Tissue Engineering Department at the University of Tokyo Hospital and venture capitalist Next 21 have performed trials on ten people in the past year and a half. Here's the process used to make an artificial bone. First, the patient's actual bone structure is scanned with X-ray and CT scanners. The resulting data is combined to make a three-dimensional computer model of the bone; a set of cross-sections is sent to the special 3D inkjet printer. The 3D inkjet printer prints onto thin layers of powdered alpha-tricalcium phosphate (alpha-TCP); the printer "ink" is a water-based polymer that hardens the alpha-TCP. Successive laydowns of powder and polymer "prints out" the bone cross-sections to an accuracy of one millimeter. The resulting artificial bone is lightweight and porous; very similar to the original human bone used as a model. The human trials were done on male and female patients, ranging in age from ten to fifty-four years. 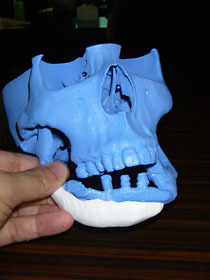 The specific bones selected for printing and transplantation are important; facial bones are being targeted because the technique does not produce a structure that is capable of bearing weight and stress like the major bones of the body (like the femur or thigh bone). However, the new artificial bones created from the alpha-tricalcium phosphate powder and polymer are ten times stronger than earlier implants made from hydroxylapatite, a naturally occurring mineral that is also the main component of natural bone. Researchers hope to make the technology commercially available by 2010. Frank Herbert dreamed of something like this when he wrote about the Atlotl/Gibiril Regimen in his 1972 book The Godmakers. Be sure to take a look at an earlier effort; see Bio Ink Jet Printing Muscle And Bone, which uses a somewhat different technique. Progress has also been made in regenerating bones; see University of California Bone Regeneration, which details a technique that has been called the most significant advance in this field in decades. Via Artificial bones made with 3D inkjet printers.